This is a mirror of the TriAtlas project by José Ramón Torres and Casey Skelton whose website at https://www.uv.es/jrtorres/triatlas.html is no longer available. What follows is almost a verbatim copy of that site. 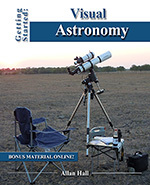 Here you can find the TriAtlas star atlas pdf of one of the best sky atlas available for free. Larger and more through than the sky & telescope’s pocket sky atlas, you should really enjoy these. (2) TriAtlas Charts are now in portrait format. 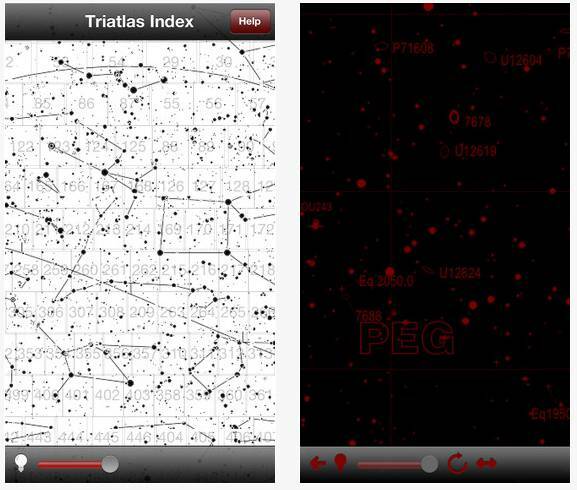 This allows viewing a larger region of the sky, placing two consecutive charts one by the other. (3) Label overlap problem practically eliminated in the TriAtlas. Even highly congested fields can be easily interpreted. The system is quite good although I think I can still do some more improvements in the future. (11) Common star names (Betelgeuse, Rigel…) and common names of deep sky objects (Minkowskii Footprint, Intergalactic Tramp…) are now also printed. Around 200 objects are labelled. (12) Line sizes now indicate brighter objects (e.g., a brighter galaxy has a thicker outline than a fainter one). Selecting the bright objects is now much easier!!!. (14) Messier objects indicated in bold and larger font. Herschel’s 400 objects are also highlighted in bold font (great for picking up the best objects). (16) Precession marks in the center of the maps (1950, 1975, 2000, 2025 and 2050). I placed them thinking in the Burnham’s Celestial Handbook lists of double stars, and other old lists out there, still very useful. The TriAtlas charts have been designed to be printed in a good quality laser printer (use at least 600 dpi and the best quality your printer allows) in A4 format, which is a standard ISO measurement usual in European countries, measuring 29 x 21.7 cm. However, the maps are vector-based and can be expanded to fit any paper size, provided that your printer has enough resolution to provide the appropriate quality. To do this, go to the print dialog of Adobe Acrobat or Adobe Reader and modify the parameters in the page management pane. The really important is page scaling: change it to a number smaller than 100% to zoom out and enlarge margins, or no scaling if you have a laser printer and you are printing A4 pages. The results are optimal in A4 page size. 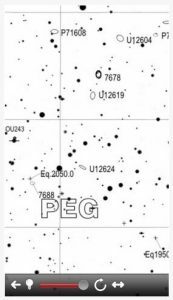 ● It shows galaxies up to 15.5 magnitude from PGC (all of them are now labeled since cluttering is not critical anymore). There are around 37,000 galaxies plotted. ● Double stars are now labeled by name. The working horse in the TriAtlas is the B-set, with a linear scale very similar to the Sky Atlas 2000 deluxe but with much more accuracy, stars and deep sky objects. It makes the location of object extremely easy, and at the same time the scale and constellation lines helps a lot to relate the sky with the maps. This set is my personal favorite as master sky atlas. Finally, the TriAtlas A-set has two purposes: to act as an index for B and C sets, and to display the brightest and best deep sky objects. This is similar to a 7-mag star atlas but reaching nine magnitude. This makes it more useful and it allows locating many bright objects without the cooperation of the other sets. INTERMEDIATE B-C SET: 218 TriAtlas charts in A4 / letter – If you want a powerful atlas but you cannot print the 571 charts of C-set, this can be the solution. It is my personal favorite edition. Download the TriAtlas second edition!!! 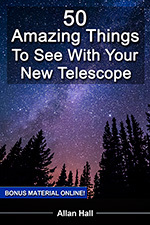 Section A includes a selection of the best deep sky objects and it is very handy to plan quick deep sky sessions and as a general reference to swap to either B- or C-maps. 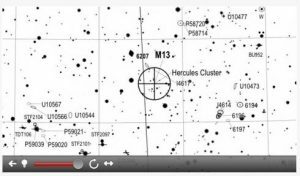 Section B includes many thousands of deep sky objects and is an atlas similar to Uranometria 2000. 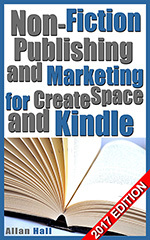 It can be used in combination with set A and the two key charts as a standard-alone atlas. Section C is the equivalent to Millennium Star Atlas, although with many more deep sky objects. Use it to find the hardest objects or in very crowded fields. Easier to print and transport than the C-set but still very powerful. This edition is my new personal favourite!!! 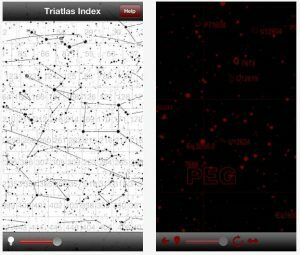 I am looking for the files for the USA version of the TriAtlas B/C charts and all the TriAtlas panorama charts. If you have them, PLEASE use the contact form at the top of the page to let me know. Norbert Schimdt, a German programmer, developed an application initially for iPhone and later for iPad to make the C-set available in these devices. We granted him permission as far the application was free (as the atlas is and has to be). He has built an excellent application that makes the use of the atlas in the field a truly joy. It is relatively modest in size (400 Mb), navigable (passing charts with the neighboring charts border tags and also through an index chart), red color with controllable brightness (or white background), compact and quick to use. The link to the apple store can be found here. He developed it under the premise that it it would be free for everybody, and we stand here our wish it has to be free and altruist as the TriAtlas itself. This is the way I printed the TriAtlas PDF charts, in a single-volume book with the most comprehensive sky atlas available. I prepared mine including all sets (A, B and C charts) before summer 2007 holidays, and I was using it in three different telescopes during all the summer, with an extraordinary performance. It allowed locating with accuracy many thousands deep sky objects, and it was an invaluable help for catching objects at the threshold, stellar planetary nebulae, etc. You just couldn’t miss objects because you didn’t know exactly where to fix your attention at the eyepiece field, or because there were too few stars to spot the place. In addition, the collection of objects was very comprehensive. No other printed atlas plotted more objects (well …except the second edition!!!). The TriAtlas included navigating aids to jump to the neighboring charts sets at higher magnifications. The chart number was at the lower right area (large outline font). Each chart included nine navigating points giving the chart number of the nearest neighboring charts within the same set, indicated in a bold font in the borders (the corners and in the middle sides). There were also smaller outline numbers in the A-charts indicating the location of the included B- and C- charts, and similar numbers in the B-charts to jump to the C-charts. 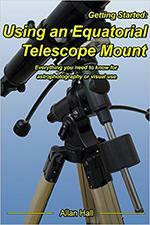 It was very easy to move around a given area, even at high magnification, and swap between sets. Constellation lines were marked in all sets to make the identification in the sky even easier. If one preferred a comfortable field atlas instead, he/she only needed to print sections A and B (around 120 A4 pages). I prepared mine like in the picture, protecting the pages of moisture with in a folder with plastic sheets. 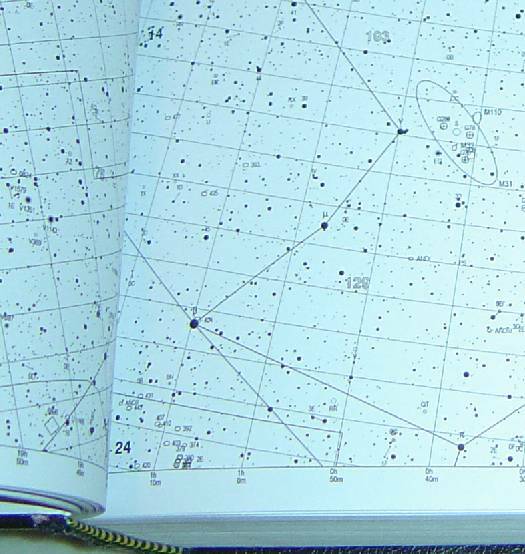 The B-set had a scale similar to Sky Atlas 2000 deluxe edition, but with much more stars and objects. Other people printed the atlas in A3 or similar formats. The maps were vector-based and could be enlarged without losses in resolution. The charts were large PDF files (=save them to disk before opening). Food output were obtained printing them with no shrinkage at 600 DPI (I generated my own charts sending them directly to the printer for a best quality, and PDF charts were not so perfect). At that state the TriAtlas was still unrefined, with overlapped labels and objects, but nevertheless a very nice work.